The tetrahedron (TD) shape is composed of four strands. When folded, each strand has 3 sides that are 17 nucleotides (nt) in length and 3 hinges that are 2 nt in length. The side sequences are designed to minimize interactions with each other, which means the TD is stable enough to be assembled in one step . This is preferable to other DNA nano shapes, because there is no need for enzyme digestion steps or labour intensive multi-step addition . The TD shape assembles with nicks (places where ends of the DNA meet) in predictable locations. As a result, sites that attract specific molecules can be added to the TD so that when it is synthesized, a single large molecule can be “trapped” inside . This feature was not exploited in this project, but allows future work with the project to involve different drug molecules. We used a RNA aptamer for protein CD71 , and tested 4 DNA aptamers for protein CD33 . The CD71 RNA aptamer was modified with a thiol group on the 5’ end to increase stability. There are two ways aptamers can be attached to the TD: by making the one of the 4 strands of the TD include the aptamer sequence, or by adding a overhang sequence onto one of the 4 strands of the TD and a complementary sequence onto the aptamer. The overhang method was chosen for two reasons. Firstly, it would allow for the easy attachment of any aptamer to the TD. Secondly, the length of the strand that would contain both the TD forming section and the CD33 aptamer would be 139 nt. This length of oligonucleotide is difficult to synthesize and might interfere with one-step self-assembly of the TD. The sequence added as the overhang is TTTTTT. This sequence was chosen because it is unlikely to interact with other sequences in the 4 strands. The SL2B aptamer, which targets vascular endothelial growth factor, a protein that is not highly expressed on acute myeloid leukemia cells was synthesized and used as a control. Fluorescein (6-FAM) fluorescence markers were added to the ends of the aptamers that were farthest away from the tetrahedron, for our microscopy experiments. 2 extra nucleotides were added in between the regular aptamer sequence to avoid having the fluorophore interfere with the aptamer’s secondary structure. A 6-FAM labelled strand of the TD was also ordered for the same experiments. The tetrahedron is composed of 4 strands. Table 1: Notation for Tetrahedron Strands. When equal parts of each of the 4 tetrahedron strands are mixed and heated to 95℃, hydrogen bond interactions between strands are disrupted, and any secondary structures the DNA strands have will melt. As the strands are subsequently cooled to 4℃, they self-assemble into the tetrahedron. The aptamer or aptamers can then be attached to the tetrahedron with a 40℃ to 20℃ temperature ramp. Gel electrophoresis is a technique used to separate DNA fragments based on size. The gel is formed by dissolving powdered agarose in an aqueous buffer, and then heating the mixture so the agarose polymerizes. A DNA stain, SYBR Safe, is added to the gel so that DNA in the gel can be visualized under UV light. DNA samples are loaded into the gel, and an electric field is induced by two electrodes on either end of the gel box. Since DNA is negatively charged, it migrates through the gel towards the positive end of the field. The mobility of the DNA fragments is determined by their size; the longer strands and bulkier conformations are less mobile because they are more hindered in the agarose; shorter strands will migrate farther down the gel in the same amount of time. DNA gel electrophoresis is a quick and easy method to confirm the proper assembly of the tetrahedron structure. The DNA tetrahedron should appear at 120 base-pairs (bp) in an agarose gel , the band location in the gel is compared to this standard with the assumption that having the same band indicates that the DNA structure has the same size and tetrahedron conformation. To prove that the DNA tetrahedrons can be properly assembled. Lyophilized DNA was resuspended by centrifuging the plate containing DNA and adding TE buffer to a DNA concentration of 100 mM. The 4 strands were diluted to 4 times the desired concentration in TM buffer, combined in equal volume, and vortexed. In a Thermocycler, the samples were heated to 95℃ for five minutes, and then cooled to 4℃. A 3% (weight/volume) agarose gel was made by adding agarose to 1X TBE buffer, and then microwaving in bursts of 30 seconds until the solution was clear. SYBR Safe was added to the flask and mixed. The gel was poured into a tray and allowed to solidify at room temperature. Once solidified, the gel was submerged in 1X TBE buffer. A 100 bp ladder was loaded into the first and last lanes. 6X loading dye was added to each sample before loading. The gel was run at 100V until the dye marks were two-thirds of the way down, which was approximately 45 minutes. A band was observed at 129 bp, with minimal smearing. We observed a band at the same position as expected from literature . Therefore, this successful assembly of the tetrahedron structure allows for further experimentation to proceed as planned. Three experiments were conducted to optimize the assembly of the tetrahedron structure and aptamer attachment. The first experiment was done to determine the optimal concentration of individual strands for assembly. The second experiment was done to optimize conditions for assembly and determine which strand should contain the aptamer binding site. The third experiment was done to optimize the time and method for aptamer binding to the tetrahedron. The stability and other characteristics of the DNA tetrahedron can differ depending on the concentration of the DNA strands, the choice of the strand with the aptamer binding site and the aptamer-tetrahedron annealing conditions. Such choices are crucial to developing the optimized structure for use in the project and clear achievement of the aims. The 4 strands were diluted to 4 uM, 20 uM, 40 uM, 60 uM, 100 uM in TM buffer, combined in equal volume, and vortexed. In a Thermocycler, the samples were heated to 95℃ for five minutes, and then cooled to 4℃. The final concentrations of tetrahedrons were 1 uM, 5 uM, 10 uM, 15 uM, and 25 uM. Samples were run through gels using the same approach as above. A clear band is observed at approximately 0.13 kb at all concentrations of tetrahedron (Figure 1). Another smeared band is observed in all lanes at approximately 0.22 kb. Figure 1: Agarose gel electrophoresis showing the optimum concentrations of the DNA strands for tetrahedron assembly. The lanes show the final concentrations of tetrahedrons of 1, 5, 10, 15, and 25 uM from left to right. 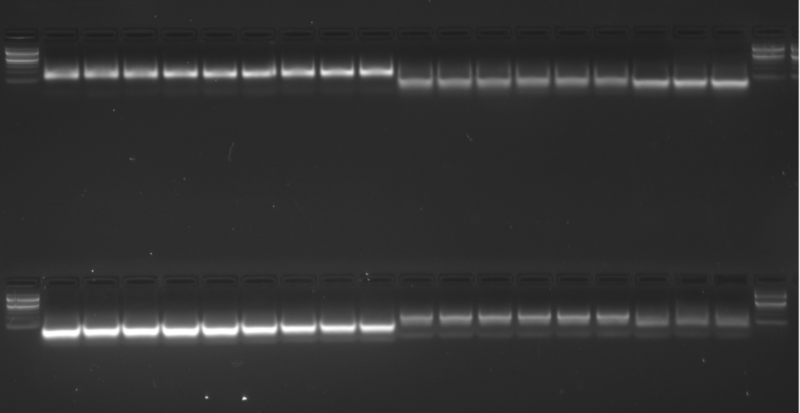 The final three bands seen on the DNA ladder (far left) are 0.1, 0.2, and 0.3 kb from bottom to top. Since a band at approximately 0.125 kb indicates the stable assembly of the DNA tetrahedron , the results from Figure 1 suggest that the tetrahedrons assembled at all concentrations. The higher band at 0.2 kb likely indicates dimerization of the tetrahedrons, or aggregation and improper base-pairing in general. The lowest tetrahedron concentration of 1 uM was used for future experiments because of these indications. Each structure was made under all three conditions, with three replicates for each condition. The samples were labelled using the schematic SX (X refers to the structure number) N/S/F (normal/slow/fast cooling) a/b/c (triplicates a to c) as shown in the table below. S1N-a, for example, refers to the first replicate of structure 1 under a normal cooling condition. Table 2: Labelling of samples based on structure, cooling condition. The samples were loaded into the gel lanes, where the structures 1 and 2 were loaded onto the upper row of the gel, and structures 3 and 4 to the bottom row. Table 3: Locations of loaded samples into gel lanes. L refers to DNA ladder. Bands at approximately 0.13 kb are seen in all lanes containing structure 1(Figure 2). A lower band below 0.1 kb is seen in all lanes with structures 2 and 3, and in lanes containing structure 4 under fast cooling conditions. Figure 2: Agarose gel electrophoresis showing the aptamer binding strands (5, 7, 9, 10) and cooling conditions for the stable assembly of the DNA tetrahedron. The first nine lanes of the upper row show structure 1 (aptamer binding strand 5) at normal, slow, and fast cooling conditions from left to right, where the three replicates of each condition are loaded in adjacent wells. The remaining lanes of the upper row represent structure 2 (aptamer binding strand 7), and similarly, the lanes in the lower row show structures 3 and 4 (aptamer binding strands 9 and 10). 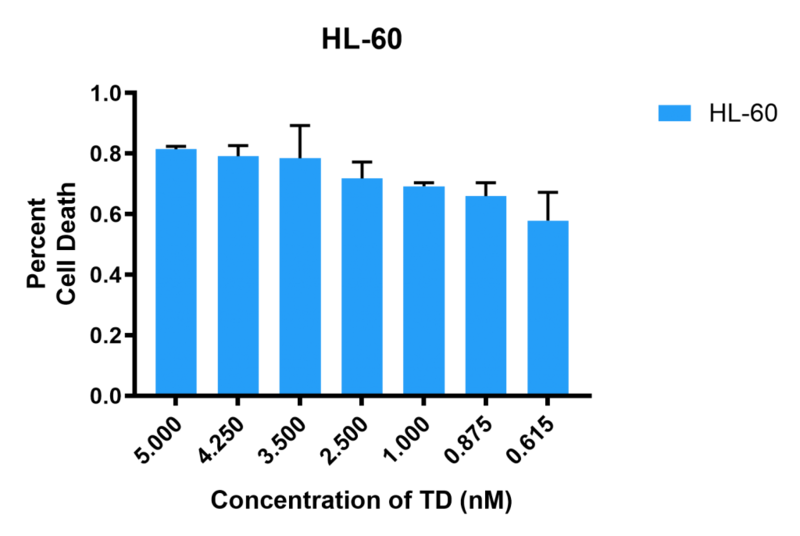 The final three bands on the DNA ladder are 0.1, 0.2, and 0.3 kb from bottom to top. 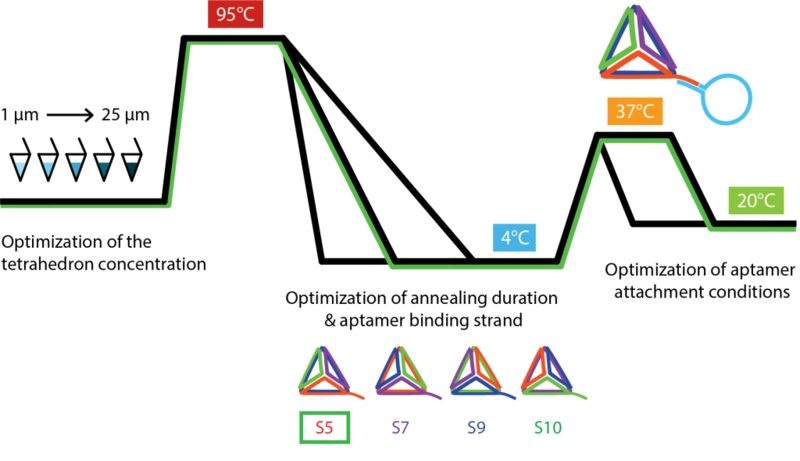 Since a band at approximately 0.125 kb indicates the stable assembly of the DNA tetrahedron, and a lower band is representative of free or inappropriately matched DNA strands, structure 1 containing aptamer binding strand 5 is concluded to be optimum under all cooling conditions. Structure 4 under normal and slow cooling conditions also produced assembled tetrahedrons, but its limited stability is suggested by the lack of proper assembly in the fast cooling condition. Thus, results suggest that structure 1 synthesized under slow and normal cooling conditions is optimum for proper assembly. To optimize the annealing conditions of four CD33 aptamers variants to a tetrahedron and determine the optimum variant for stability. 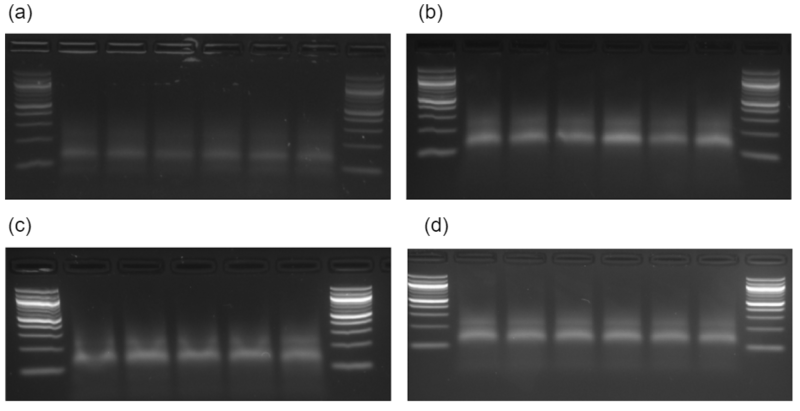 Three replicates were performed using each of the four aptamer strands with either a cooling ramp or incubation at 37℃. Each sample was labelled using the schematic AX (X refers to the aptamer number) C/M (cooling ramp/maintenance at 37℃) a/b/c (triplicates a to c) as shown in the table below. A1C-a, for example, refers to the first replicate where aptamer 1 is being annealed to the tetrahedron with a cooling ramp. Table 4: Labelling of samples based on annealing condition and aptamer. Strong bands at 0.13 kb are seen in all lanes in Figure 3, corresponding to the distance traveled of an assembled DNA tetrahedron without an aptamer attached. Faint and smeared bands are observed at 0.25 kb in Figures 3b, c, and d (CD33 aptamer variant 2 to 4 respectively). Faint bands are observed for Figure 3a (CD33 aptamer variant 1) below 0.10 kb. Figure 3: Agarose gel electrophoresis showing the optimum CD33 aptamer under two annealing conditions. Gel image (a) shows the first variant of the CD33 aptamer, where the first three lanes correspond to the incubation condition, and the subsequent three correspond to the cooling ramp condition. Gel image (b) shows the second variant of the CD33 aptamer, and images (c) and (d) show the third and fourth variants respectively. 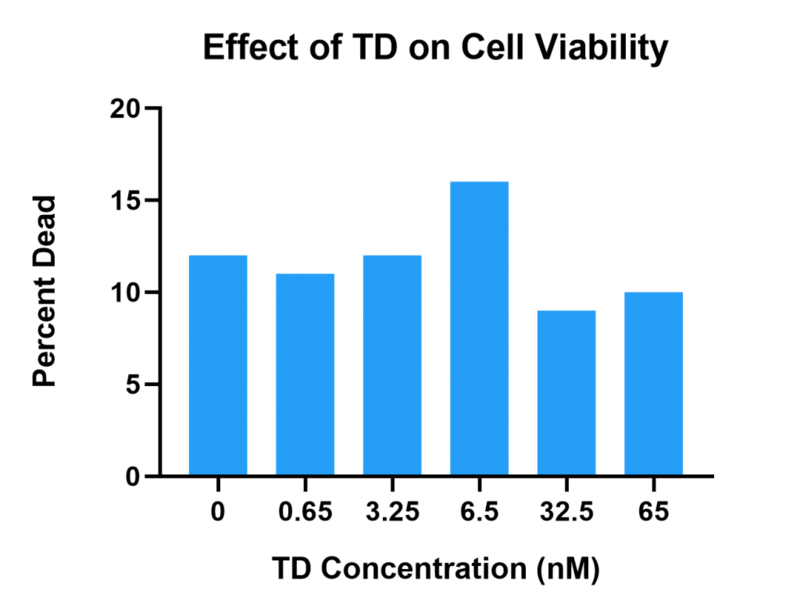 The final three bands on the DNA ladder are 0.1, 0.2, and 0.3 kb from bottom to top. The assembled tetrahedron at 0.13 kb is observed in all four gel images in Figure 3, corresponding to all four variants of the CD33 aptamer. Since the CD33 aptamer is only 84 base pairs, it is not possible to differentiate between a DNA tetrahedron structure with or without a bound aptamer on the gel. However, a band corresponding to unbound aptamer at approximately 0.09 kb can be seen in the tetrahedrons incubated with CD33 aptamer 1 for both annealing conditions (Figure 3a). Thus, it was concluded that aptamers 2 to 4 likely bound to the tetrahedron in both the 37℃ and the cooling ramp conditions. The bands at approximately 0.25 kb show tetrahedron dimers or the aggregation of strands in general, seen in the gel image in experiment 1 (Figure 1), and therefore, are likely not caused by the aptamers themselves. In future experiments, the CD33 aptamer 4 was used and annealed to the tetrahedron using a 37℃ incubation period. Tetrahedron assembly was found to occur at tetrahedron concentrations of 1 to 25 uM. Aptamer binding strand 5 was found to be optimum under slow, normal, and fast cooling conditions. The second, third, and fourth variants of the CD33 aptamers have also likely annealed to the DNA tetrahedron. Thus, for the following experiments, structure 1 (strands 2, 3, 4, and 5) under normal cooling conditions at a 1 uM concentration was used. The fourth variant of the CD33 aptamer was used and annealed using a 37℃ incubation period. In total six different aptamers were used: four CD33 aptamers, a CD71 aptamer, and the SL2B aptamer which served as the negative control. Three experiments were conducted to assess the binding affinity of the aptamers to their respective proteins. The first experiment used native stepped PAGE to prove DNA tetrahedron assembly with the CD33 aptamer and its capability of binding to the targeted receptor. Results from this experiment did not align with what was expected, therefore this approach was considered to be infeasible for effectively reaching project aims. The second experiment used centrifugal filters to confirm that the proteins were binding to the aptamers and to evaluate the performance of the four CD33 aptamers. 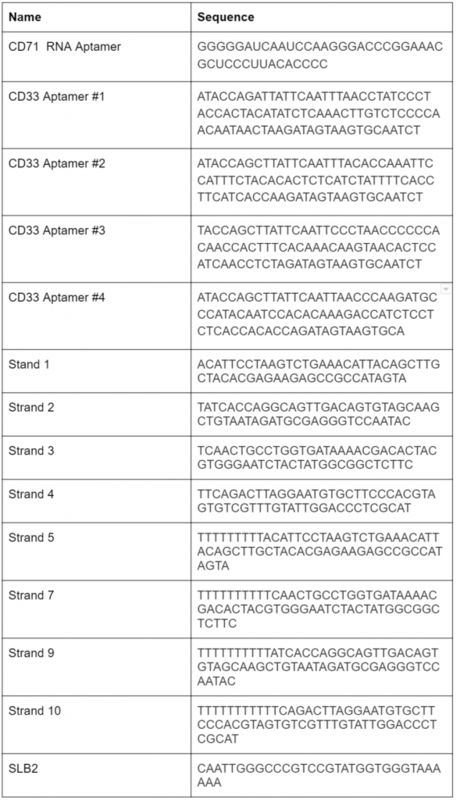 There were some issues associated with the control but that was taken into account when reviewing all results and the best performing CD33 aptamer was selected. This best performing CD33 aptamer from the second experiment and the CD71 aptamer were tested on HL-60 (a cell line from a 36 year old caucasian female with myeloid leukemia) cells and a binding curve was established using flow cytometry. Native stepped PAGE (PolyAcrylamide Gel Electrophoresis) is a type of gel electrophoresis. The “native” means the PAGE contains no denaturing agent, so proteins retain their tertiary structure. The “stepped” means the samples are run through gels of 2 different concentrations stacked on top of each other. The stacking gel (top layer) is used to concentrate the sample, so that migration through the resolving gel (bottom layer) will occur at the same time. Similar to agarose gel, the apparatus for PAGE gels have two electrodes to induce an electric field. DNA is negatively charged so it migrates from the cathode to the anode. The rate at which fragments of DNA travel through the gel is dependent on size. Because the gel is a polymer, smaller DNA fragments slide through with less hindrance therefore they can move further. Successful attachment of aptamers to tetrahedrons is indicated by the presence of both the protein and the DNA in the same band. The purpose of this experiment is to prove that the synthesis of a DNA tetrahedron with the CD33 aptamer is possible and that the aptamer is capable of binding to the targeted receptor. Successful binding will be indicated by the presence of bands in the gel at the correct distance, corresponding to the size of the bound tetraderon-aptamer complex. DNA samples will be tested against different thickness of PAGE gels, 6% and 12% to optimize for the best experimental conditions. The recommended concentration of the final tetrahedron-aptamer complex should be 1 uM . Prior to combining all the strands of the DNA tetrahedron together (S2 – S5), each one was diluted to 5 uM from 100 uM. This ensured that once combined, the final concentration of the tetrahedron-aptamer complex is indeed 1 uM, as there are 5 components to be added ( 4 strands of DNA + the aptamer). 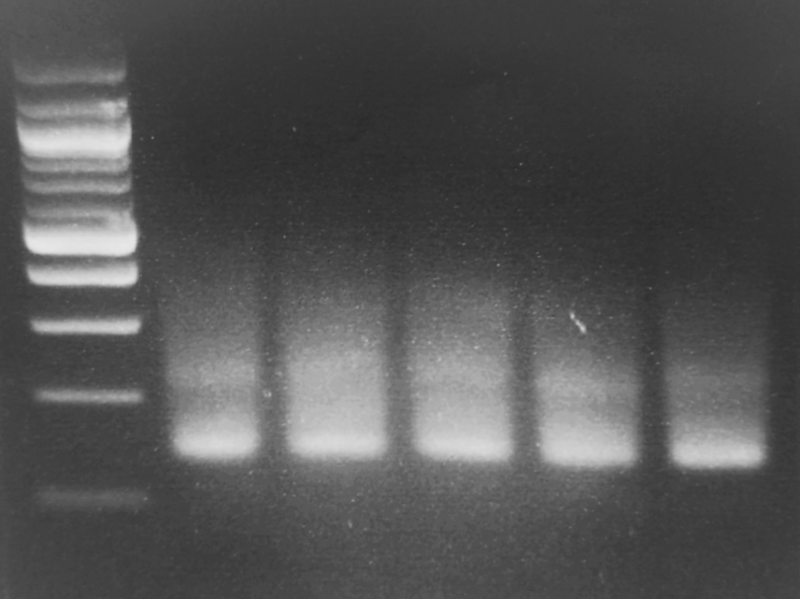 PCR tubes were labeled S2 to S5, to which 5 uL of the corresponding strand was added from stock to 95 uL of TM buffer. Following, another set of PCR tubes were labelled, 1 – 4, and A12, representing which tubes were to contain which aptamer. 10 uL of S2 to S5 were added to each of these PCR tubes, resulting in a final volume of 40 uL each. The tubes were then transferred to the thermocycler for assembly and heated at 95˚C for 5 minutes, followed by cooling to 4˚C for 30 seconds and return to 20˚C. To prepare the aptamers, tubes were labelled CD 1 to CD 4, with the final tube labelled SL2B. Within each tube, 1 uL of the aptamer was added to 19 uL of TM. 10 uL of each aptamer was added to the corresponding tubes (1-4, S2LB) containing the tetrahedrons, for a final volume of 50 uL. The complex was then returned to the thermocycler for final assembly, subjected to a decreasing ramp from 40℃ to 20℃ at a rate of 0.5℃ per minute Tetrahedron and CD33 protein were mixed in water so the final concentrations where 3 uM for the tetrahedron and 3ug/mL for the protein. Gels were prepared according to the table below. TEMED is added last, as it acts as the catalyst in the polymerization reaction. The resolving gel of higher concentration, 12%, was made first and allowed to solidify beneath an ethanol layer before the stacking gel (6%) was poured on top. Load each sample with 6x loading dye to which each well contains 30 uL. Additionally load 5 uL of ladder solution to one of the wells.The addition of a ladder allows the samples to be compared to a default rate that DNA travels through the gel, to gage the size of the tetrahedron-aptamer complex. Run the gel at 110 volts for 90 minutes. The gels were stained by submerging them in a solution made from 100 mL of milli Q water and 10 uL of Sybr safe, which allows the DNA to become visible when imaging. The gels were left in the bath on a horizontal rotator for 20-30 min and imaged under UV light. 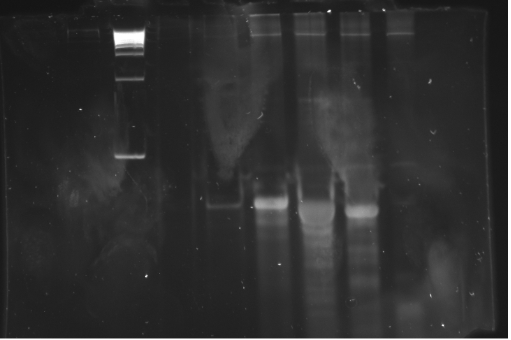 Figure 4: Evidence that all images of produced gels were inconclusive due to smearing. Banding patterns observed in the stacking gels did not provide clear enough bands to indicate the successful binding between protein and tetrahedron. Repeated trials were conducted along with gels with altered concentrations, however similar results were produced. Due to time requirements of on average 5 hrs and high specificities of exact concentrations needed to produce clear images, PAGE gels were concluded to be a un-feasible approach for effectively reaching project aims. Amicon filters, a type of centrifugal filter, are molecular mass selective; unbound CD33 (67kDa) should pass through the 100 kDa Amicon filter. When the DNA tetrahedron binds to either protein, the complex becomes over 100 kDa and gets retained. The BCA assay can be used to measure the total concentration of protein through colourimetric techniques. The BCA solution contains Cu2+ ions that are reduced to Cu+ by peptide bonds. The amount reduced is proportional to the concentration of protein present. Two molecules of bicinchoninic acid chelate with Cu+ to form a purple-coloured complex, and the amount of absorbance of the solution can be used to determine protein concentration. After samples have been run through the Amicon filter, the amount of protein in the retentate is measured using the BCA assay. Protein attachment to only tetrahedrons with the complimentary aptamers is the basis of the targeting aspect of the project. This selectivity must be proven before starting experimentation will cells. Tetrahedrons with aptamers were assembled with the protocol optimized in Part I to 5uM. Tetrahedron and CD33 protein were mixed in water so the final concentrations were 3uM for the tetrahedron and 3ug/mL for the protein. Additionally, sample of 3uM protein with no DNA was created. Previous experiments showed that incubating the samples at 37℃ led to inaccuracies in the BCA assay, possible due to protein aggregation caused by heat, so the samples were incubated overnight at 4℃. The DNA-Protein Complexes were then centrifuged in a 100kDa Amicon filter. The filtrate was discarded. The retentate was recovered by spinning the filters upside down in another tube. Retentate samples were topped up with water to 150uL. The concentrations of protein in the retentate, and in the filtered pure protein sample were determined using a BCA Assay Kit. 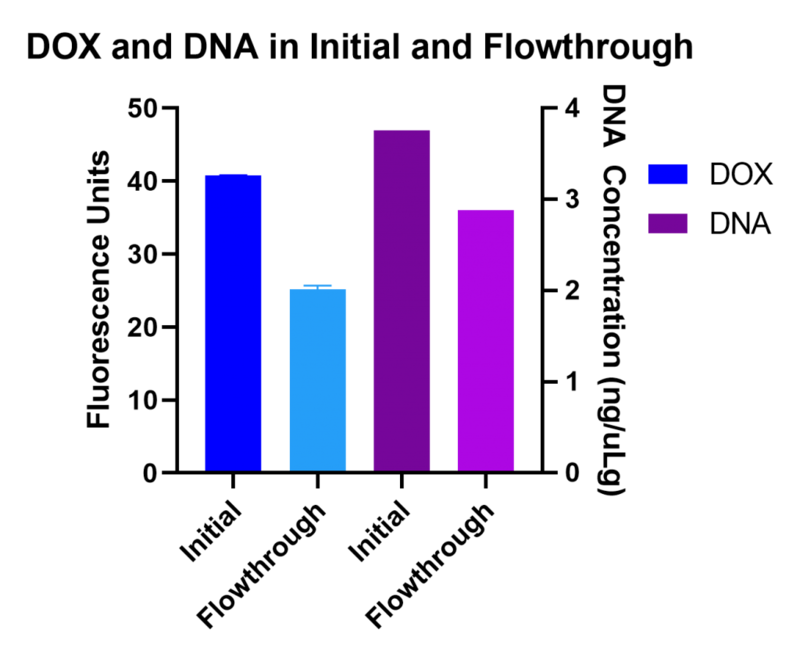 Figure 5 shows the mass of protein trapped in each filter. In preparation, 1.53ug of protein is added to each sample. The control aptamer is nonspecific to CD33, and should not lead to trapped protein. All samples display increased protein retention in the filter. This likely a result of the non-specific attractions interactions between DNA and proteins and increased resistance to protein flow caused by large masses of DNA. The difference in captured protein between the samples is not a significant enough to confirm binding between the aptamers and the CD33 protein. However, based on the results of this experiment Aptamers 2 and Aptamers 4 were selected for the flow cytometry experiment. Verification of the TD-aptamer complex binding to the targeted receptor on the surface of leukemia cells can be achieved through flow cytometry. 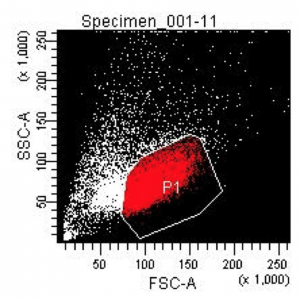 Flow cytometry was performed at the UBC FLOW facility, using a BD FACSAria Ilu cell sorter. The specificity of the aptamer to the target receptor is determined by comparing the binding affinities of CD33 and CD71 aptamer-tetrahedrons to the binding affinity of SL2B aptamer-tetrahedrons to target cells. 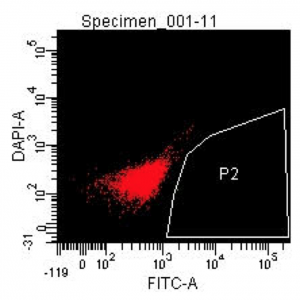 The results from the flow cytometry show that CD33-aptamer tetrahedron was a valid substitute for the CD33 targeting antibody. In addition, flow cytometry allowed us to determine the binding efficiency of various other aptamers to the cell. The results from the flow cytometry graph can also be used to generate a binding affinity constant in the future. Cytometry is a cell analysis technique that allows for the measurement of cell characteristics such as cell size, count, and cell cycle . Clinical applications of flow cytometry include the diagnosis of leukemia through analysis of leukocyte characteristics [1; 2]. In research, flow cytometry can be used to sort and separate cells based on expressed surface receptors. A flow cytometer works by sending cells through a channel, one at a time where a laser light beam illuminates each cell. The cell will cause the light scattering, which can be measured and correlated with the cell size. Forward angle scatter (FSC) and side angle scatter (SSC) measurements are taken to characterize the cell.  If a fluorophore is present, the laser light will also excite the fluorophore to produce a fluorescence emission. All this information is collected by a detector and processed by the computer to produce a Dot plot .  The Dot plot will then allow for the determination of the number of cells bound to the aptamer. Although the presence of protein-aptamer binding can be determined through molecular weight separation methods such as Native stepped PAGE and Amicon filtration, they have limitations, as discussed previously. Flow cytometry can precisely show binding of the DNA structure with a fluorescent probe to the receptors expressed on the surface of the cell. The results will provide an indication of how well the tetrahedron can target the CD33 receptor on the surface of leukemia cells. 1. To determine whether the aptamer binds to the CD33 receptor expressed on the surface of HL-60 cells. 2. To determine if other aptamers are able to bind to the CD33 receptor on the surface of HL-60 cells to consider alternative methods of targeting. Flow cytometry was performed in the UBC FLOW facility at the UBC Life Sciences Center. The BD FACSAria IIu cell sorter was used to characterize the cells and detect the FAM-labelled aptamer. While the instrument can be used as a fluorescence-activated cell sorter (FACS), it was not required in this experiment. The machine was set to characterize the forward angle scatter (FSC) and side angle scatter (SSC) of 150,000 events. The 488 nm FITC Channel/Laser was used to excite the FAM fluorescence probe. Our tetrahedron samples were synthesized as per the tetrahedron assembly protocol. A FAM-labelled aptamer was obtained from IDT, while HL-60 cells were grown in 12 well plates at a volume of 0.8 mL and a density of 100,000 cells per 200 µL. Table 7: Concentrations of samples used in flow cytometry. The tetrahedrons were incubated with the HL-60 cells for 2 hours. Following incubation, the cells were centrifuged at 300 g for 5 mins and resuspended in 1 mL of PBS. The centrifugation and resuspension process was performed for a total of two times. The cells were centrifuged again and resuspended in 5mL of PBS with 0.5% paraformaldehyde (PFA) to fix the cells. Figure 6: Forward angle scatter (FSC) and side angle scatter (SCC) results of HL-60 cells incubated with just the diluent (Sample 11). 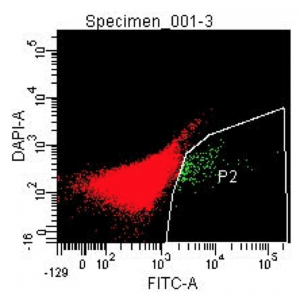 The viable HL-60 cells were highlighted to appear as red in the selection P1. Figure 7: The fluorescence of HL-60 cells incubated with just the diluent (Sample 11), the region where cells with fluorescent probes bound were expected to appear is selected in P2 region. 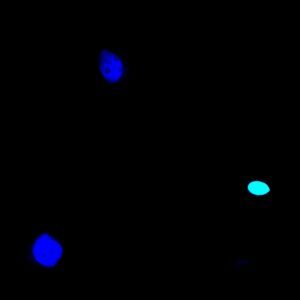 Figure 8: The fluorescence measurement of HL-60 cells incubated with CD33 aptamer at a concentration of 0 nM (Sample 1). 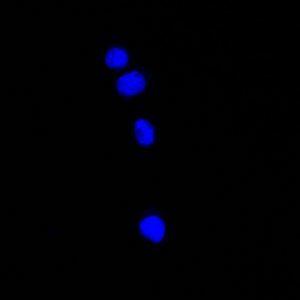 Figure 9: The fluorescence measurement of HL-60 cells incubated with CD33 aptamer at a concentration of 5 nM (Sample 2). Figure 10: The fluorescence measurement of HL-60 cells incubated with CD33 aptamer at a concentration of 10 nM (Sample 3). 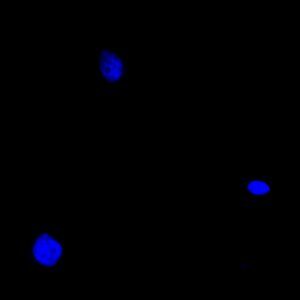 Figure 11: The fluorescence measurement of HL-60 cells incubated with CD33 aptamer at a concentration of 50 nM (Sample 4). Figure 12: The fluorescence measurement of HL-60 cells incubated with CD71 aptamer at a concentration of 0 nM (Sample 5). Figure 13: The fluorescence measurement of HL-60 cells incubated with the CD71 aptamer at a concentration of 5 nM (Sample 6). Figure 14: The fluorescence measurement of HL-60 cells incubated with the CD71 aptamer at a concentration of 10 nM (Sample 7). Figure 15: The fluorescence measurement of HL-60 cells incubated with the CD71 aptamer at a concentration of 50 nM (Sample 8). Figure 16: The fluorescence measurement of HL-60 cells incubated with the SL2B aptamer at a concentration of 50 nM (Sample 9). As seen from the flow cytometry results above, the CD33 aptamer is shown to bind to the HL-60 cells. As a result, the CD33 aptamer described by Zaimy et. al is adequate for properly guiding the tetrahedron to the HL-60 Cells. The SL2B aptamer was added at a concentration of 50 nM. While the aptamer does bind, the binding efficiency is better using the CD33 aptamer. As the fluorescent aptamer binds to the VEGF165, it shows how it can be another possible method of targeting AML cells. The binding efficiency of doxorubicin (DOX) to the tetrahedron was assessed by incubating different concentrations of DOX with the structure, and then passing the solution through a PCR purification column. In theory, the DOX loaded DNA binds to the filter, and the free DOX in the filtrate is measured using a microplate reader. The concentration of DNA in the filtrate from this experiment was tested with a Qubit assay. A significant amount of DNA was found in the filtrate, which means that the columns were not filtering as expected. Loading efficiency could still be determined from these results, but this method could not be used to separate free DOX from the structure. PEG precipitation was used instead to separate DOX-loaded tetrahedron from free DOX. Doxorubicin belongs to the anthracycline category of chemotherapy drugs. It intercalates between double stranded DNA to inhibit the progression of topoisomerase II and therefore prevents DNA replication. This ability enables it to intercalate between the strands of the tetrahedron, thereby loading the structure. Since DOX is fluorescent, its concentration can be measured using a microplate reader. The optimal ratio of DOX to DNA for highest loading efficiency is variable in literature, so a wide range of DOX concentrations was tested. A Qubit fluorometer uses fluorescent dyes to determine the concentration of DNA in a sample. The dye used is specific to DNA, and fluoresces when bound to its target. 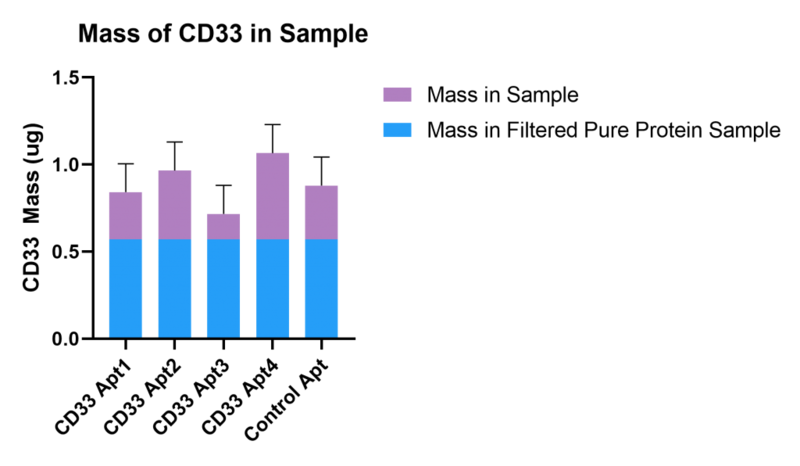 When a certain amount of dye is present, the amount of fluorescence as measured by the fluorometer is directly proportional to the concentration of DNA in the sample. Since the dye is highly specific, the assay provides a more accurate measurement than a Nanodrop. However, since both DOX and the dye binds by intercalation, the Qubit assay can only be performed on unloaded tetrahedrons, with the assumption that DOX does not change the interactions between the structure and the filter in the column. Witnessing the successful and efficient intercalation of DOX into the structure was key to the rest of the project, as only loaded tetrahedrons can serve as proper drug delivery vehicles to acute myeloid leukemia cells. To ensure that the DOX-loaded tetrahedrons were binding to and eluting from the purification column appropriately, tetrahedrons without DOX were passed through the column, and the concentrations of DNA in the flowthrough and eluents were measured using a Qubit assay. DOX was diluted with milliQ water, first to make an aliquot of 800 uM, then to the concentrations of 0 uM (no DOX), 100 uM, 200 uM, 300 uM, and 400 uM. For each concentration of DOX, two samples were prepared – one with tetrahedrons, and one without to serve as a control. The samples were then wrapped in aluminum foil and incubated at 4 ⁰C for 8 hours. Each sample was pipetted into a PCR purification column and centrifuged at 13200 rpm for 1 minute at room temperature. The flow-through was then diluted by a factor of ten using PBS, and loaded into a black 96-well plate. Three replicates were taken for each sample. DNA tetrahedrons were loaded into a PCR purification column and centrifuged at 13200 rpm for 1 minute at room temperature. The flowthrough was removed and saved. DNA was eluted from the column five times successively using milliQ water. A Qubit Assay was performed on the original tetrahedron solution, the flow through, and the elutions. Figure 17: Loading Efficiencies and amount loaded of DOX onto tetrahedrons at varying concentrations of DOX. Table 8: Data from QuBit Assay. Figure 18: Flowthrough of filtered DOX compared to DNA in initial solution. Two studies mentioned their results in the number of DOX molecules intercalated into the tetrahedron. As described by Kim et al. through their use of gel filtration to remove unloaded DOX, they determined that 26 DOX molecules per tetrahedron were found to be loaded after comparing the concentration of DNA relative to the concentration of DOX. Despite this, Sun et al. reported that 330 DOX molecules were loaded into the tetrahedron. Due to the discrepancies in results, the methods for determining DOX loading as mentioned by Kim et al. were repeated. As observed in Figure 17, the experiment demonstrated that DOX was loaded successfully onto the tetrahedron using the specified protocol. The amount of DOX loaded generally increased as the initial concentration of DOX increased, but the loading efficiency peaked at 200 uM. When looking at Figure 18, the measured fluorescence between the initial solution and the flow-through indicates that a large amount of DOX had eluted from the column. From looking at the fluorescence results for DOX quantification, a substantial amount of DOX was unbound to the tetrahedron and eluted. It seems to indicate a relatively low DOX-loading capacity which supports the results from Kim et al. ; however, there was also a significant percentage of bound tetrahedron eluted from the column when performing the Qubit assay. When integrating both sets of results, it instead suggests that Kim et al., may have significantly underestimated their DOX loading estimations due to flaws in experimental design with the amount of eluted DNA not being measured. Regardless, there was too little DNA bound to the filter using this method in the first place for this to be a viable strategy of separating DOX-loaded tetrahedron from free DOX in the solution. As a result, PEG precipitation was used as an alternative option for the separation of the DOX-loaded tetrahedron. Polyethylene glycol (PEG) is a neutral polymer that can be used to purify DNA through precipitation. At high concentrations and in the presence of salt, it interacts with DNA to form a compound called psi-DNA. The precipitate can be isolated from the supernatant to obtain a purified product. The DOX-loaded tetrahedrons must be isolated from the free DOX in the solution before being used to treat cells. Otherwise, the targeting ability of the tetrahedron-DOX would be compromised by the activity of unbound DOX. The use of PEG will allow for the precipitation of the structure, followed by extraction and purification. For this experiment, since the final yield had to be determined using a Qubit assay, which does not work when DOX intercalates between the DNA strands, the unloaded structure was purified as a proof of concept. A PEG solution was made by combining PEG with NaCl for a final concentration of 17.5% (w/v) PEG and 250 mM NaCl. This was added to the tetrahedrons, and the mixture was then incubated at 4℃ overnight. To recover the DNA, the solution was centrifuged for 20 minutes at 10000 g. The supernatant was removed and the pellet was resuspended in TM buffer. Through performing PEG precipitation, it was determined by mass that 90% of the DNA was recovered. Since the final yield of purified DNA acquired through PEG precipitation is significantly higher than the amount eluted from a column, PEG precipitation was the method used for all further experiments involving the isolation of DOX-loaded tetrahedrons from free DOX. This was also inclusive of preparation and purification of the DOX-loaded tetrahedron samples for HL-60 cell treatment. Visualization of cell organelle was required to prove the tetrahedron was accumulating in the nucleus as expected. 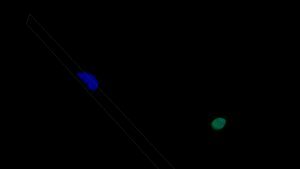 HL-60 cells that were incubated with DNA-tetrahedrons and imaged using confocal laser scanning microscope. Three types of tetrahedrons were tested: without an aptamer, with the CD33 aptamer. Each tetrahedron had a fluorescent FAM label. Tetrahedrons loaded with DOX were incubated with HL-60 cells to test cell uptake with a PrestoBlue Viability and a Trypan Blue dye exclusion test. Tetrahedrons with no DOX were incubated with HL-60 cells and imaged using a confocal microscope. Confocal imaging allows for imaging cells at exact planes of focus and viewing of detailed structures of cell components. In previous experiments, we were able to show cell death. Confocal imaging is used to confirm where the DOX loaded tetrahedrons kill the cell by accumulation in the cell nucleus.The confocal imaging was performed at the UBC Biomedical Research Centre using the Leica SP5 X Laser Scanning Confocal Microscope. Confocal microscopy is used to image cross sections and internal organelle of cells. In confocal microscopy, organelle specific stains are used to visualize of a specific region of the specimen while excluding light from the environment. A nucleus stain was used in this experiment, because the nucleus was the are of the cell the tetrahedron was expected to be found in. With laser scanning confocal microscopes, the scanning is done using a focused laser spot across the sample . In the imaging path, a filter in the shape of the illuminated structure is blocks light from the environment that is not part of the structure. Images are created through scanning the illuminated structure in tandem with the filter . This allowed for high resolution in imaging of slices which are compiled to create 3D representations . The primary application of confocal microscopy studying molecules within cells and tissue samples. Confocal microscopy has superior imaging capabilities to traditional microscopy. One of the reasons our tetrahedron is an improvement on ADCs is that it will accumulate in nucleus and slowly release, avoiding off target effects of loaded drugs. This mechanism had to be proved by showing that the tetrahedron ends up in the cell nucleus after endocytosis. Confocal imaging is a technique that allows the visualization of the location of the DNA within the cell. To determine the localization of the DOX-loaded tetrahedron within the cell for an assessment of the drug’s cellular pharmacokinetics and its method of action. Samples were centrifuged at 1000 rpm for 5 minutes. Cells were removed from cell culture media and resuspended in PBS with 4% paraformaldehyde to a volume of 120 µL. Cells were at a final concentration of 5 x 10^5 cells/mL. Samples were fixed onto confocal microscope slides in a cytospine at 200 rpm. Cover slips were placed on the slides and sealed. Confocal imaging was done using the Leica SP5 X Laser Scanning Confocal Microscope at the UBC Biomedical Research Centre. Areas on the slides with high concentrations were found manually. These areas were scanned with a confocal laser set at 488 nm and 358 nm to image molecules stained with the FAM and DAPI dye respectively. 4 locations from the cells treated with TD with CD33 aptamer were scanned. 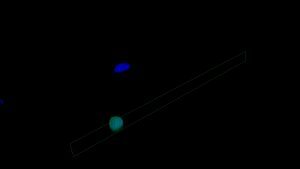 DAPI scans show the cell nucleus and FAM scans show DNA. Figure 19: From top to left, DAPI and FAM scan, DAPI scan and FAM scan for HL60 cells + TD with CD33 aptamer from location 1. The z-stack is a composite of all the image slices taken at a location. Figure 20: z-stack of HL60 cells + TD with CD33 aptamer from location 1. Figure 21: From top to bottom, DAPI and FAM scan, DAPI scan and FAM scan for HL60 cells + TD with CD33 aptamer from location 2. Figure 22: z-stack of HL60 cells + TD with CD33 aptamer from location 2. 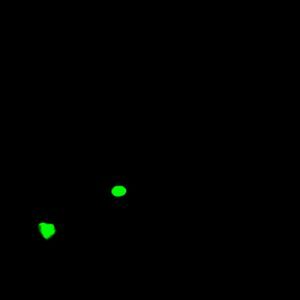 Figure 23: From top to bottom, DAPI and FAM scan, DAPI scan and FAM scan for HL60 cells + TD with CD33 aptamer) from location 3. Figure 24: z-stack of HL60 cells + TD with CD33 aptamer from location 3. Figure 25: From top to bottom, DAPI and FAM scan, DAPI scan and FAM scan for HL60 cells + TD(+CD33apt) from location 4. Figure 26: z-stack of HL60 cells + TD with CD33 aptamer from location 4. 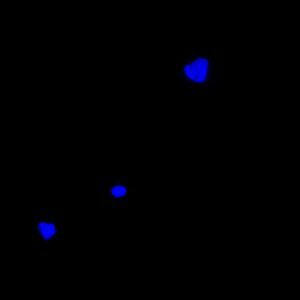 Figure 27: Picture of the complete DAPI and FAM scan from the cells with no TD. Figure 28: Cross section of two cells from HL60 cells + TD with CD33 aptamer location 4. The is no FAM dye seen in the AML cell with no tetrahedron. In the cells treated with tetrahedron with CD33, the only location where FAM is seen is with the DAPi stain, in the nucleus. From the cross section images in figure # shows two nucleuses. 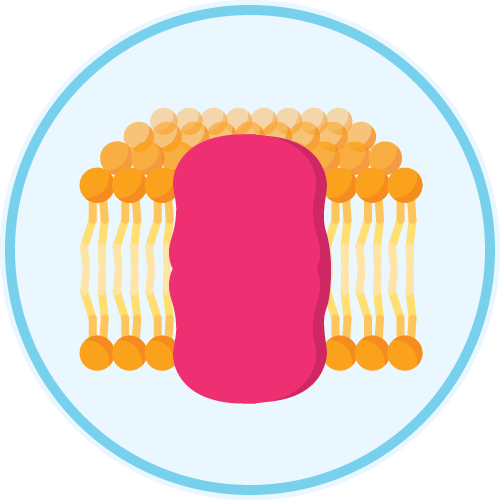 One has FAM dye completely through it, indicating the DNA tetrahedron has penetrated the nucleus. These results confirm that our tetrahedron will enter the cell and accumulate in the nucleus. The lethality of the DOX-loaded tetrahedron to HL-60, an AML cell line, can be evaluated in an in-vitro environment. Assays performed in-vitro also provide definitive proof that the structure is able to target and attack AML cells. To properly count the number of cells, various proliferation assays were conducted. The in-vitro cell work was performed at the Hirst Lab at UBC. 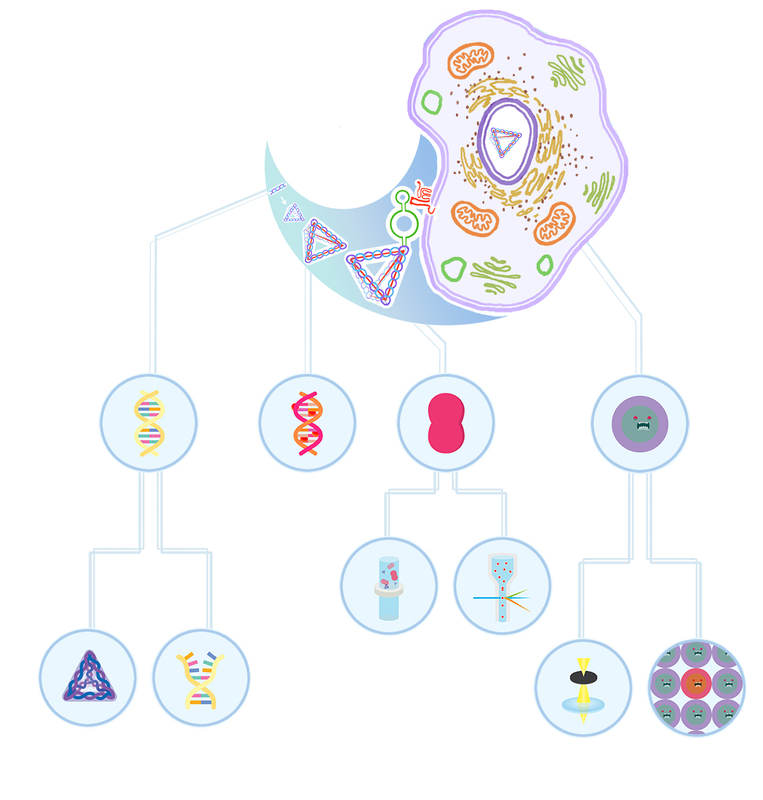 Measuring the number of viable cells after exposure to the DNA structure confirmed that the DOX-loaded tetrahedron is a possible replacement for antibody-drug conjugates. In addition to HL-60 cells which expresses CD33, the ability of the structure to eliminate AML cells that do not express CD33 was assessed. The selectivity of the tetrahedron was demonstrated by comparing the results from the two different cell lines. During these experiments two cell counting assays were used. Presto blue was used for the majority of the experiments due to its speed and ease of use. However, the results of the experiment were confirmed through the use of Trypan Blue assay. The approximate number of live and dead cells in a culture can be determined by exposing samples to Trypan blue dye. Cells that are alive will actively pump the dye out, whereas the nuclei of dead cells will retain the dye, and therefore be stained. The density of live and dead cells is determined by the amount of blue staining when imaged in an automated cell counter. 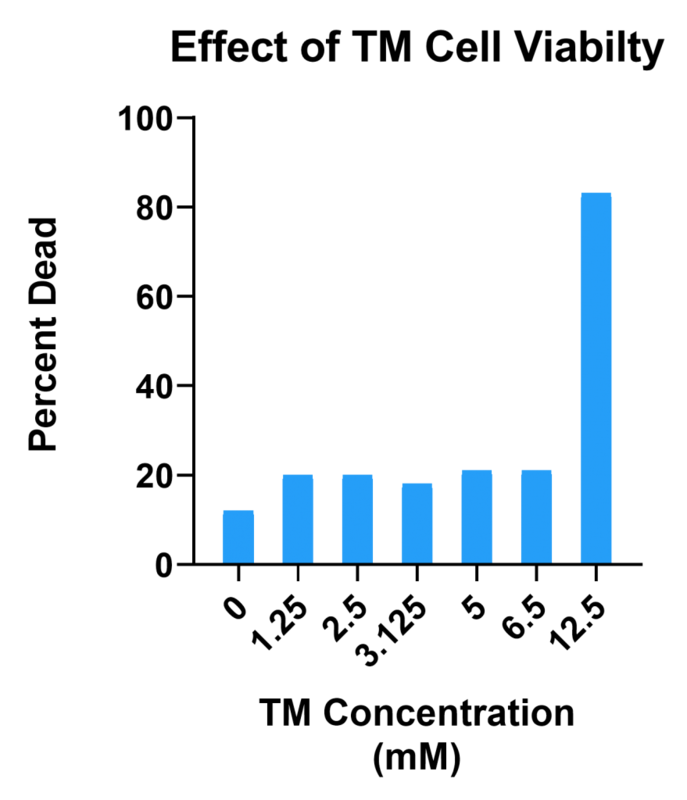 The initial number of cells and the rate of proliferation prior to counting is known. Viable cells that are metabolically active maintain a reducing environment within their cytosol. In its natural state, PrestoBlue cell viability reagent is blue in colour and has no fluorescence. In the cytosol of a viable cell, the reagent gets reduced from its resazurin form (blue and non-fluorescent) to its resorufin form that is red and highly fluorescent  . 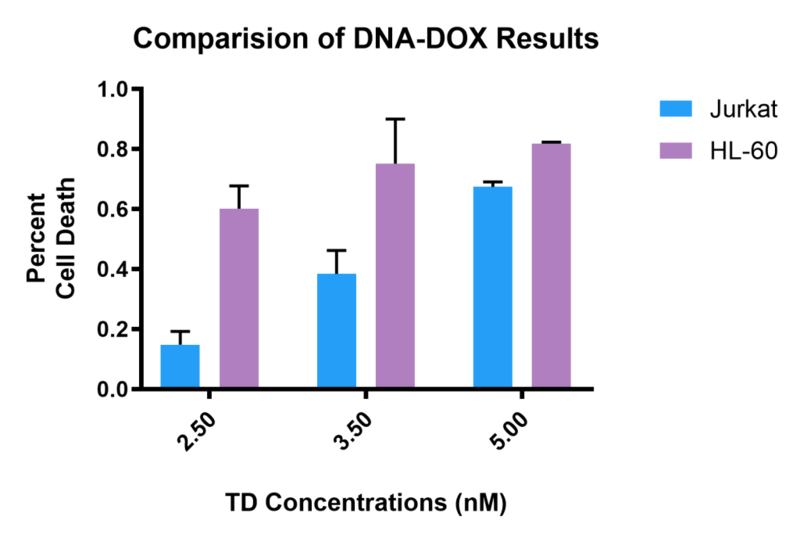 The conversion between these two forms of the reagent can be measured and used to determine the number of metabolically active cells. Both of these assays allow for the determination of the effectiveness of the structure at eliminating AML cells. This set of experiments allows for modelling the effects of the structure on the cells at varying concentrations, and demonstrates the lethality of the structure to an AML cell line. The in-vitro assay also provides definitive proof that our structure is able to target and attack AML cells. The use of two cell lines will also allow us to determine how efficiency of the aptamer in selective targeting. Cell plates were removed from incubation and were resuspended by pipetting up and down. In another plate, 10 uL of cell media was added to and mixed with 10 uL of Trypan Blue. 20 uL were then inserted into a slide and fed into the automatic cell counter, in which measurements were recorded in densities of non-viable cells. Cell plates were removed from incubation to which 11.6 uL of PrestoBlue dye was added directly to the cell culture medium and resuspended by pipetting up and down. The reagent was also added to the empty media as a control.  The concentration of viable cells was determined by measuring the fluorescence emission of the wells at 590 nm. For the experiment two cell lines were used. HL-60 is a common Leukemia cell line obtained from a 36 year old Caucasian female. The line was used in the testing of the Pfizer ADC, Mylotarg . The line is positive for the CD33 surface protein allowing us to target it with our DNA structure. The DOX loaded Tetrahedrons were assembled as previous mentioned. The solution was diluted to a DNA concentration of 25 nM. The DNA was then diluted further to the concentrations mentioned below using TM Buffer as the dilutent. Figure 29: Effect of TM at varying concentrations on cell viability of HL-60 cells. Figure 30: Effect of tetrahedron (TD) at varying concentrations on cell viability of HL-60 cells. Figure 31: Effect of DOX loaded tetrahedron (TD) at varying concentrations on cell viability of HL-60 cells. Figure 32: Effect of DOX-loaded-tetrahedron (TD) at varying concentrations on cell viability of HL-60 cells (CD33 positive) and Jurkat cells (CD33 negative). 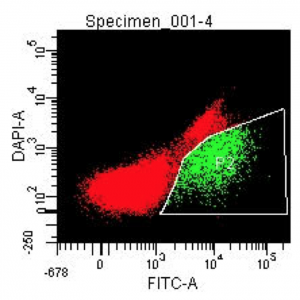 The results from adding various amounts of TM buffer to the HL-60 cells demonstrate that the cells are only significantly affected by the buffer at relatively high concentrations [Figure 29]. As the original buffer in which the structure was solubilized in (TM) does not negatively affect the cells, it was not necessary to lyophilize the DNA as done in other papers . Another concern was that the TD, even without DOX loaded, would have a negative impact on the cell since it is a foreign DNA structure. However, as demonstrated Figure 30, the addition of various concentrations of the TD does not affect cell viability. 48 hours after the addition of DOX-loaded tetrahedrons, cell viability was measured using the PrestoBlue reagent. As can be clearly seen in the percent cell death of HL-60 cells in Figure 31, the DNA Structure is quite effective at delivering doxorubicin to the cell. The range above provides an idea of the possible therapeutic range for future in-vivo experiments. The stark difference of percent cell death between the Jurkat and the HL-60 cells in Figure 32 clearly shows the selectivity of the structure. At higher concentrations, however, the DNA structure was able to kill a higher amount of Jurkat cells. While another cell line is a good method of determining the selectivity of the DOX loaded TD, it does have its flaws. Over time, the DNA structure will breakdown and release the doxorubicin into the extracellular media. In addition, while Jurkat and HL-60 cells are similar, they do have different tolerances to doxorubicin. To properly determine the selectivity of the structure, in-vivo experiments should be done. Erben CM, Goodman RP, Turberfield AJ. Single-molecule protein encapsulation in a rigid DNA cage. Angewandte Chemie (International ed. in English). 2006;45(44):7414-7417. https://www.ncbi.nlm.nih.gov/pubmed/17086586. doi: 10.1002/anie.200603392. Goodman RP, Berry RM, Turberfield AJ. The single-step synthesis of a DNA tetrahedron. Chemical communications (Cambridge, England). 2004(12):1372. https://www.ncbi.nlm.nih.gov/pubmed/15179470..
 How a Flow Cytometer Works. ThermoFisher Scientific. https://www.thermofisher.com/ca/en/home/life-science/cell-analysis/cell-analysis-learning-center/molecular-probes-school-of-fluorescence/flow-cytometry-basics/flow-cytometry-fundamentals/how-flow-cytometer-works.html. Accessed October 20, 2018. Blood Tests. The Leukemia & Lymphoma Society of Canada. http://www.llscanada.org/managing-your-cancer/lab-and-imaging-tests/blood-tests. Accessed October 20, 2018. Hibbs AR, SpringerLINK eBooks – English/International Collection (Archive), SpringerLink (Online service). Confocal microscopy for biologists. New York: Kluwer Academic/Plenum Publishers; 2001. 10.1007/978-0-306-48565-7. Assessment Report for Mylotarg. European Medicines Agency. 2018. Walter, R. B., Raden, B. W., Kamikura, D. M., Bernstein, I. D., & Cooper, J. A.(2005). Lysosomal Degradation of CD33, the Target for the Anti-Leukemia Immunoconjugate, Gemtuzumab Ozogamicin: Evidence for Cbl-Mediated Monoubiquitination. Blood. 2005;106(11), 2469. http://www.bloodjournal.org/content/106/11/2469.